The Earl of Sandwich, grandson of Charles II’s Earl of Sandwich, and first Lord of the Admiralty during the North administration, had for his mistress a Miss Ray, whom he had rendered as accomplished as she was handsome. Some say that she was the daughter of a labourer at Elstree, others of a stay-maker in Covent Garden. Her father is said to have had a shop in that way of business in Holywell Street in the Strand. Miss Ray was apprenticed at an early age to a mantua-maker in Clerkenwell Close, with whom she served her time out and obtained a character that did her honour. 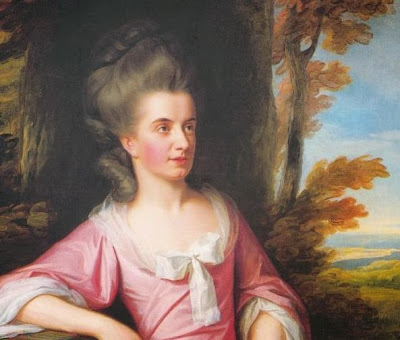 A year or two after the expiration of this period she was taken notice of by Lord Sandwich, who gave her a liberal education; rendered her a proficient in his favourite arts of music and singing; and made her his mistress. He was old enough to be her father. Lord Sandwich was in the habit of having plays and music at his house, particularly the latter. At Christmas the musical performance was an oratorio, for, “to speak seriously,” says Mr. Cradock, “no man was more careful than Lord Sandwich not to trespass on public decorum.” This gentleman, in his Memoirs, has furnished us with accounts which will give a livelier idea of the situation of Miss Ray in his Lordship’s house than any formal abstract of them. Again:—”I did not know his lordship in early life; but this I can attest, and call any contemporary to ratify who might have been present, that we never heard an oath, or the least profligate conversation at his lordship’s table in our lives. Miss Ray’s behaviour was particularly circumspect. Dr. Green, Bishop of Lincoln, always said, ‘I never knew so cautious a man as Lord Sandwich.’ The Bishop came too soon once to an oratorio; we went to receive him in the dining-room, but he said, ‘No; the drawing-room is full of company, and I will go up and take tea there.’ Lord Sandwich was embarrassed, as he had previously objected to Lady Blake speaking to Miss Ray between the acts; and as the Bishop would go up, a consequence ensued just as I expected. Some severe verses were sent, which Mr. Bates intercepted. While Miss Ray was thus situated, his lordship, through the medium of a neighbour, Major Reynolds, became acquainted with a brother officer of the major’s, a Captain Hackman, and invited him to his house. The Captain fell in love with Miss Ray, and Miss Ray is understood not to have been insensible to his passion. He was her junior by several years, though the disparity was nothing like the reverse one on the part of Lord Sandwich. Sir Herbert Croft, who wrote a history of their intimacy and correspondence, under the title of “Love and Madness,” represents the attachment as mutual. According to his statement, Hackman urged her to marry him, and Miss Ray was desirous of doing so, but fearful of hurting the feelings of the man who had educated her, and who is represented as a sort of Old Robin Gray. In this sentiment, Hackman with all his passion is represented as partaking. Sir Herbert’s book, though founded on fact, and probably containing more truth than can now be ascertained, is considered apocryphal; and Mr. Cradock, who is as cautious in his way as his noble acquaintance, doubts whether any man was really acquainted with the particulars. All that he could call to mind relative to either party was, that for three weeks after the Captain’s introduction, till his military pursuits led him to Ireland, he was observed to bow to Miss Ray whenever she went out; and that Miss Ray, during the latter part of her time at the Admiralty, did not continue to speak of her situation as before. “She complained,” he says, “of being greatly alarmed by ballads that had been sung, or cries that had been made, directly under the windows that looked into the park; and that such was the fury of the mob, that she did not think either herself or Lord Sandwich was safe whenever they went out; and I must own that I heard some strange insults offered; and that I with some of the servants once suddenly rushed out, but the offenders instantly ran away and escaped. One evening afterwards, when sitting with Miss Ray in the great room above stairs, she appeared to be much agitated, and at last said, ‘she had a particular favour to ask of me; that, as her situation was very precarious, and no settlement had been made upon her, she wished I would hint something of the kind to Lord Sandwich.’ I need not express my surprise, but I instantly assured her, ‘that no one but herself could make such a proposal, as I knew Lord Sandwich never gave any one an opportunity of interfering with him on so delicate a subject.’ She urged that her wish was merely to relieve Lord Sandwich as to great expense about her; for as her voice was then at the best, and Italian music was particularly her forte, she was given to understand she might succeed at the Opera-house, and as Mr. Giardini then led, and I was intimate with Mrs. Brooke and Mrs. Yates, she was certain of a most advantageous engagement. I then instantly conjectured who one of the advisers must have been; and afterwards found that three thousand pounds and a free benefit had been absolutely held out to her, though not by the two ladies who managed the stage department. Whether any proposals of marriage at that time or afterwards were made by Mr. Hackman, I know not.” Be this as it may, Hackman’s passion was undoubted. He was originally an apprentice to a merchant at Gosport; was impatient of serving at the counter; entered the army at nineteen, but during his acquaintance with Miss Ray, exchanged the army for the church, “as a readier road to independence;” and was presented to the living of Wyverton in Norfolk. Whatever was the nature of the intimacy between these unfortunate persons, a sudden stop appears to have been put to Hackman’s final expectations, and he became desperate. By what we can gather from the accounts, Lord Sandwich, either to preserve her from her lover or herself, thought proper to put Miss Ray under the charge of a duenna. Hackman grew jealous either of him or of some other person; he was induced to believe that Miss Ray had no longer a regard for him, and he resolved to put himself to death. In this resolution a sudden impulse of frenzy included the unfortunate object of his passion. On the evening of the fatal day, Miss Ray went with her female attendant to Covent Garden Theatre to see “Love in a Village.” Mr. Cradock thinks she had declined to inform Hackman how she was engaged that evening. Hackman, who appears to have suspected her intentions, watched her, and saw the carriage pass by the Cannon Coffee-house (Cockspur Street, Charing Cross), in which he had posted himself. Singularly enough, Mr. Cradock happened to be in the same coffee-house, and says that he wondered to see the carriage go by without Lord Sandwich. This looks as if there was more in Hackman’s suspicion than can now be shown. Hackman followed them. Hackman was executed at Tyburn. He confessed at the bar that he had intended to kill himself, but he protested that but for a momentary frenzy he should not have destroyed her, “who was more dear to him than life.” It appears, however, that he was furnished with two pistols; which told against him on that point. It is impossible to settle this point. The general impression will be against Hackman; but, perhaps, the second pistol, though not designed for himself, might have been for Miss Ray. His victim was buried at Elstree, where she had been a lowly and happy child, running about with her blooming face, and little thinking what trouble it was to cost her. His lordship afterwards lived in retirement, and died in 1792.